2002 Pontiac Grandprix GT - 360 Horsepower - PT-61 custom built turbo (Precision Turbo – good for 700 HP) for an additional, Turbonetics EVO wastegates w/ multiple psi settings, Monza blow off valve (BOV) Custom-made stainless steel exhaust crossover assembly, Custom-made mandrel bend tig-welded 2.5" stainless steel downpipe with u-bend removal Carsound high flow catalytic Converter - Custom-made stainless steel intake pipe flow-matched Lucas/Delphi 42.5 lb/hr fuel injectors Custom Reprogrammed PCMAN fitting oil lines, oil “T”, custom adaptor for oil return 3-ply silicone connectors K&N valve cover breather High-flow air filter with custom fenderwell intake setup180 deg. Thermostat Colder spark plugs Full custom exhaust Taylor wires Ported manifolds Coming soon Full intercooler & electric cut-out. 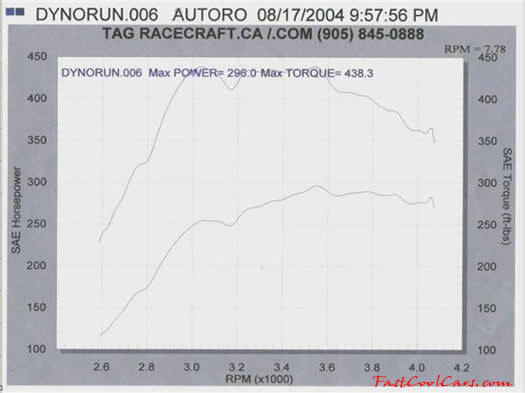 - See the "GM" page for more pictures, and dyno sheet ...very cool.